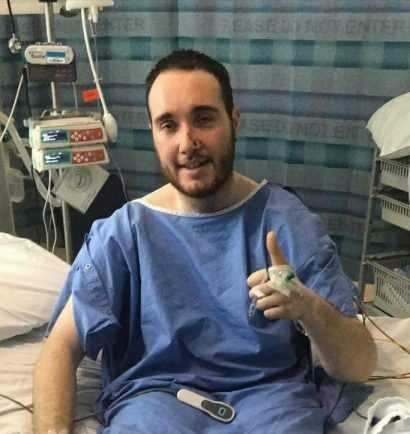 Recovering: Ben Perry in hospital after his operation. A BRAVE Special Constable involved in a collision while helping a member of the public has been offered the best wishes of West Mercia Police and Crime Commissioner John Campion. Ben Perry was off duty, when he witnessed a collision on the M42 between Hopwood and Bromsgrove and went to assist. He was struck by a second vehicle, suffering serious injuries, leading to the amputation of his lower right leg. Ben is now in a stable condition in hospital where he will require further surgery and will remain there for the foreseeable future. PCC Campion said: “My thoughts are with Ben and his family, and I wish him well with his recuperation. “He acted selflessly, facing potential dangers, to help others; yet another example of the work of our volunteers, which I always find so very humbling. Others including Special Chief Officer Nick Marlow have praised Ben’s dedication and selflessness.